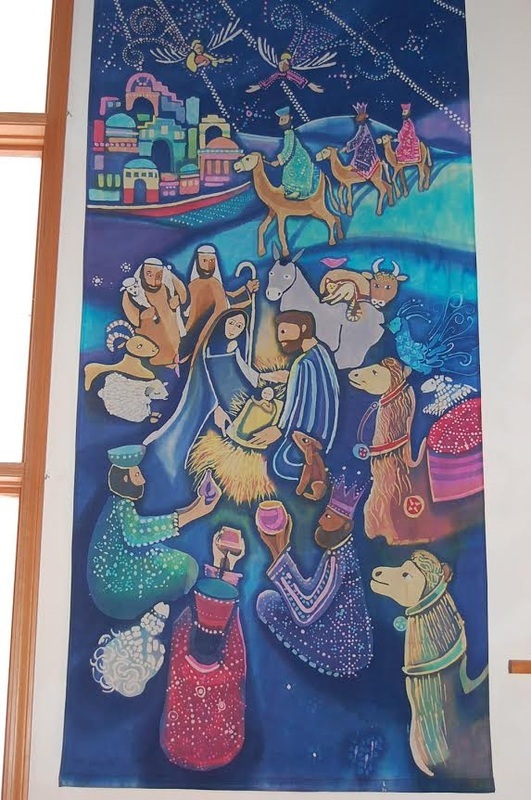 Our congregation is blessed with some very talented artists. 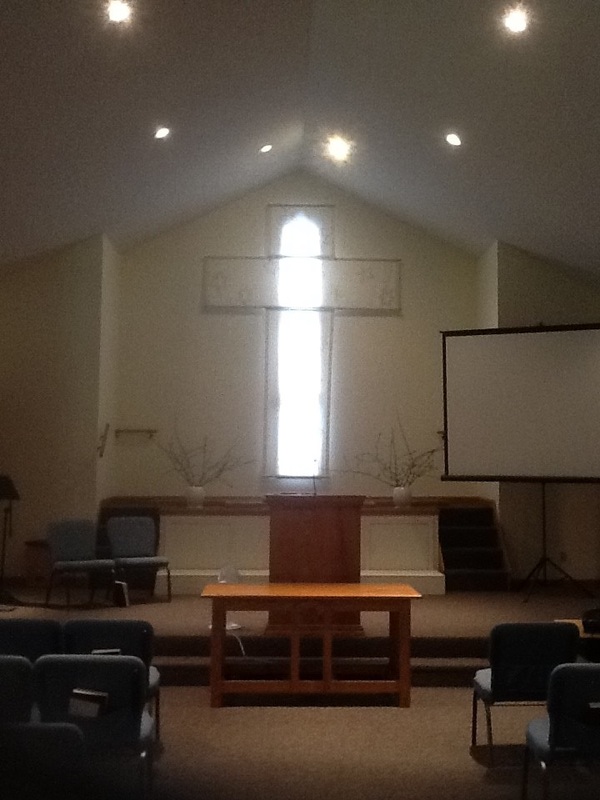 Many of our services are made all the more worshipful with these additions. ​In this season of Lent, we remember the events that led to the crucifixion. We are forced to confront our own capacity for betrayal, for evil, for failure. We remember our own suffering while we recall the suffering that Jesus endured for us. Isaiah tells us, “Surely he has borne our griefs and carried our sorrows.” We recognize the duality that exists within ourselves and within our world: the tendency to be pulled in two different directions. We struggle to act with the best part of ourselves: to choose good over evil, to accept rather than reject faith, to walk in light instead of darkness. 2 The second banner, placed above the first, illustrates three figures. The central figure can be read as the figure of Christ or an apostle of Christ crossing his arms as he extends them to persons on either side. The figure on the right pulls away in fear or confusion or rejection. The figure on the left tentatively reaches out in response to the central figure. The color blue is introduced in the center to symbolize spiritual love, truth and faithfulness. Flickers of yellow – the color of illuminated truth, truth removed from shadows – reach down to the figures. Flame-like shapes above the heads of the figure allude to the tongues of fire that appeared above the heads of the Apostles during Pentecost, representing the Holy Spirit. 4 ​In the fourth banner, the tree branches out in sacrifice for the cross it will become, and from its branches emerges an arc of a Crown of Thorns, one of the symbols of the Passion. In Hosea 9:6 and 10:8, thorns symbolize punishment for sins, so it is with irony that such a symbol was cruelly placed upon Jesus’ head by those who simply intended to mock a man who claimed to be king. This symbol of suffering and sacrifice stands in stark contrast to the green laurel wreath used as a sign of victory or the crowns of gold worn by royalty. ​6 The sixth banner completes the most familiar shape of the Cross, the Latin cross. On each side of the arch of the window is a Palm Branch. The shape of the arched window itself can allude to the gates of Jerusalem through which Jesus entered the city. Palms and palm trees were generally known as religious symbols in the Near East and Israel. Palms were used in Solomon’s Temple, and in Ezekiel’s vision of the Temple. Roman emperors used palms, a common pictorial image in Greek and Roman art, as a symbol of their victories on the coins they used. For the people of Israel to wave palms before Jesus would have been seen as a threat to Roman power. 3 ​The flickers in the second banner find their source in the flames that extend down from the third banner. The fire which is symbolic of religious fervor and martyrdom becomes the roots of a tree which begins to grow. The Tree of Jesse represents the genealogy of Christ; the tree also corresponds to the Tree of Life. In a broader context, the tree in Christianity represents the cyclical nature of the cosmos, immortality, growth and creative powers. It also foreshadows the Cross. The color red is traditionally associated with passion, blood and fire; it is the color of love and hate, of power and action, of sin and suffering. I am also using the twisting tree in a chaotic wilderness to represent the passion of Jesus’ ministry – a world turned about. The sunflower is an ancient symbol of Christ. Thought to be heliotropic (helio – sun ; tropic – movement), a flower which turns toward the sun, the sunflower was used to represent Christ’s obedience to God. Just as the sunflower always turns to face the light or sun, Jesus always turns his face to God. Here, the sunflower stands in the season of harvest, its head bowed down; its sepals encircle the seed head like a crown of Thorns. Seeds scatter like tears that fall. Chronos: human chronology, horizontal time. Kairos: God’s time, real time, vertical time. The horizontal line of the cross relates to chronos, and the vertical line of the cross relates to kairos. Where chronos and kairos intersect is the Cross: the death and resurrection of Christ is where we begin to define and understand our faith. Although absolute darkness was originally intended at the crux of the cross in the design of the banners, consider the irony that the light of the vertical window breaks through that darkness. Each banner is a batik, a dye-resist process using wax. Layers of wax are painted onto cloth over areas to be saved, then subsequent layers of dyes are painted over and around the waxed layers soaking into the unblocked cloth. When the batik is complete, the wax is removed. In some years, each banner is hung on a successive Sunday in Lent, culminating in a complete design on Palm Sunday. In other years, the complete set of banners is hung on the first Sunday in Lent. Click on thumbnails for large views of the individual photographs. Or, for a continuous slide show, click on the Play button (which appears on the top left corner of the largest photograph, when you hover your cursor over the photo). 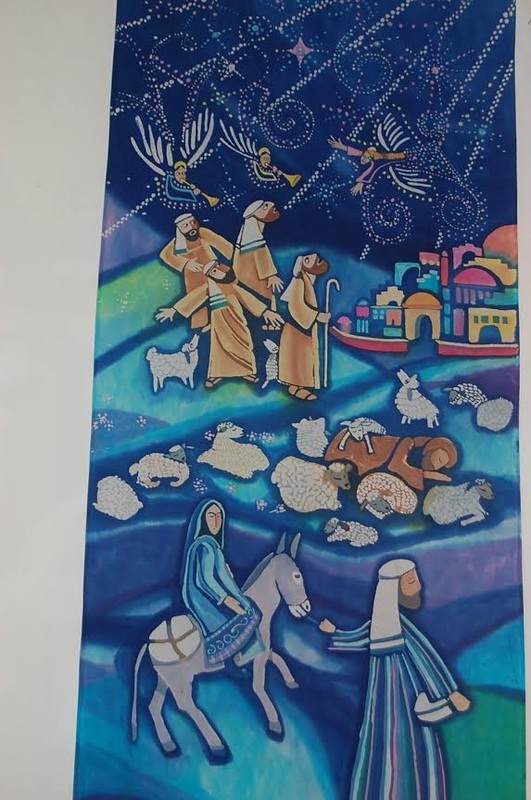 In 2014, the worship committee provided advent decorations which intentionally incorporated several Christian symbols. Some of these - among the many throughout the sanctuary - are explained here. Three trees denoted the trinity of the Father, Son, and Holy Spirit. The largest, most colorful, and lush tree represented God the Father. The gold and white tree represented the Holy Spirit. The blue tree swaddled in garland -- and graced by an angel -- reminded us of the night of Jesus’ birth. 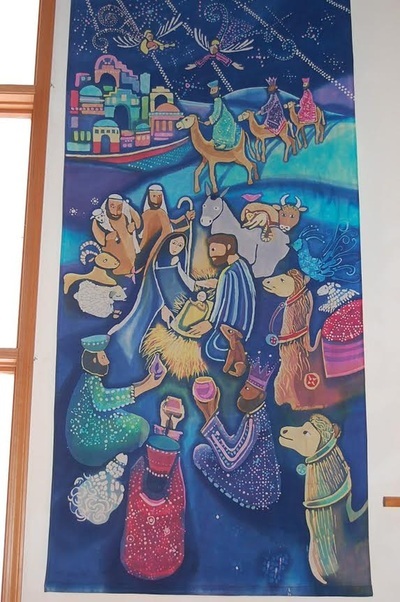 The largest star represented the star followed by the wise men. The great tree is adorned with light and life. The crown of thorns lies in broken branches on the ground. Scattered flowers tell of a grace burst open. Butterflies give wing to the rising of new life. ... the other turns away, reminding us that while Jesus died once and for all, we are free to follow him … or not. 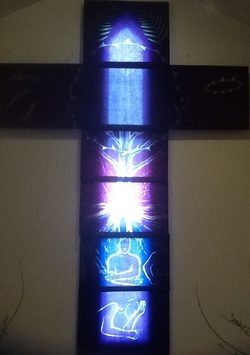 made by our own Robin Ripley, flanking the window in the front of the sanctuary.